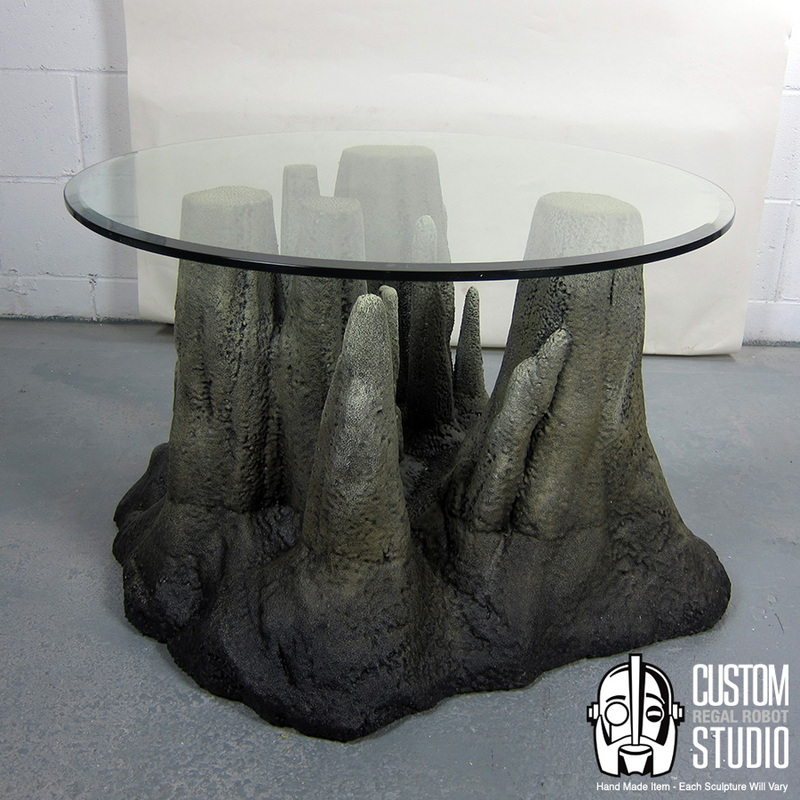 The STALAGTABLE melds furniture and art in a series of hand sculpted one of a kind coffee and side tables! We love exploring ways to bring sculpture into people’s homes as functional elements. 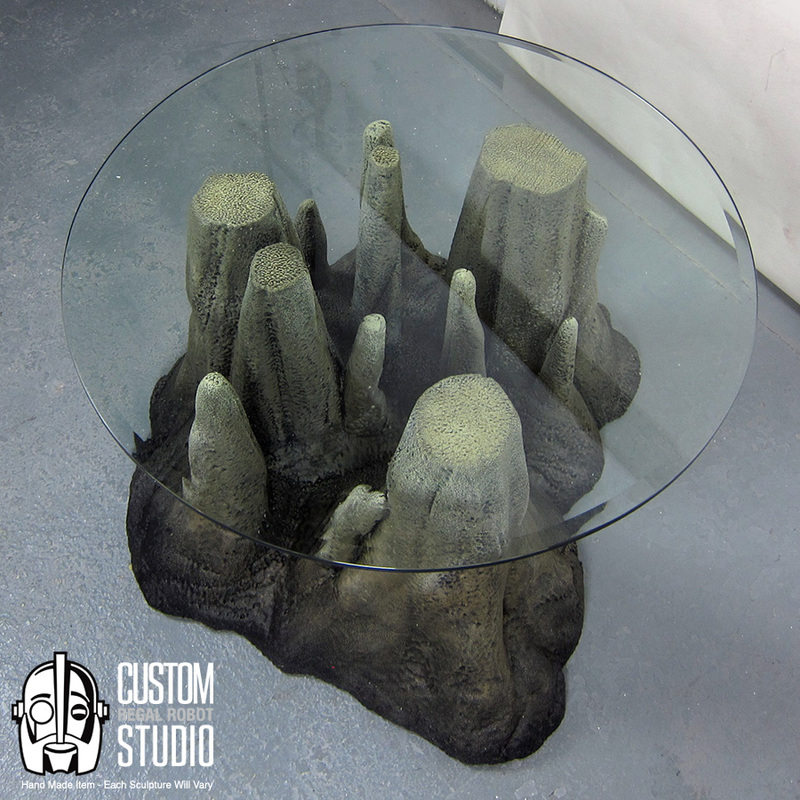 The Stalagtable cave inspired stalagmite coffee table is our new series of hand made, one of a kind furniture art for your home, office, man cave or fan cave (and perhaps those last two, especially!). Each table is hand carved in the Regal Robot Custom Studio from a rigid foam, then hard coated with an ultra durable resin coating, similar to the way theme park props are made. Because they are sculpted and painted by hand, no two tables will look exactly alike. Every Stalagtable will be a one of a kind piece. Available in two sizes, the stalagmite inspired tables can be made for you as both a coffee table and a side table. At 18″ tall and with a 36″ diameter glass top, the coffee table is $1499 including delivery anywhere in the continental US. The side table version features a 24″ diameter round glass top and is 24″ tall. It retails for $1299, once again, including delivery in the continental US. If you’re not in the continental US, simply contact us to request a shipping quote to your home or office! You’ll find the Stalagtable alongside the TAYBLES cassette tables and eventually, many other originals on our themed furniture designs page. And remember, our custom studio makes everything to order, so additional custom sizes and styles are always available – simply send a custom furniture request with the details of what you’d like and we’ll get you a quote!